"The Venezuelan government expresses its strong rejection of dangerous statements by US President Donald Trump and Brazilian President Jair Bolsonaro made on March 19… The Venezuelan government will continue to work in compliance with international law in order to ensure the creation of a zone of peace in Latin America and the Caribbean", the statement said. 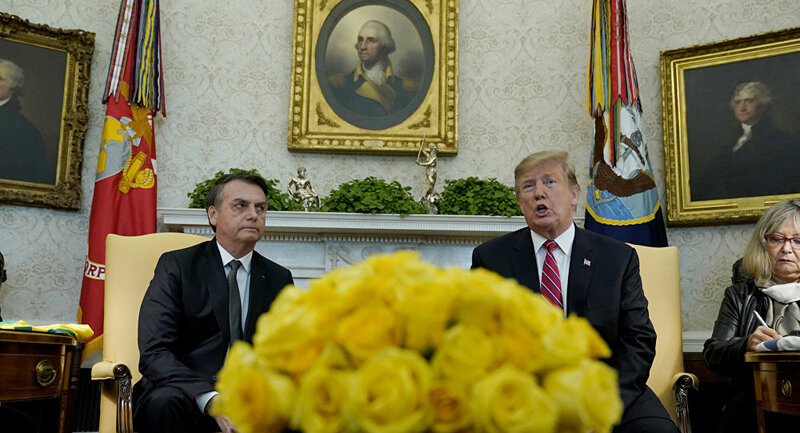 On Tuesday, US President Donald Trump and his Brazilian counterpart Jair Bolsonaro held talks, following which they reiterated their support for Venezuelan opposition leader Juan Guaido. When asked about the possibility of a military intervention in Venezuela, Trump said that "all options are open". Venezuela has been in a state of political crisis since January, when Guaido, the head of the opposition-run National Assembly, illegally declared himself interim president. He was immediately recognised by the United States, which froze $7 billion in the country's oil assets and called on Venezuelan President Nicolas Maduro to step down immediately. While dozens of nations have since endorsed Guaido, Russia, China and numerous others have reaffirmed their support for Maduro as Venezuela's only legitimate president.